Beautiful black crop top with floral design and ruching down the front. Gorgeous little top. Would go great with high waisted jeans! Machine wash on delicate cycle. Has sequins on the sleeve, none missing. Express black velvet & sheer crop top. It is a size medium & in excellent condition. Measurements:Underarm to underarm-16” Length from shoulder seam down-25” Check out my other items! I combine shipping! Take the highest shipping cost, then only $1.99 for each additional item! I usually ship within 24 hours. Please make payment within 2 days. I strive for positive feedback, I closely look over every item before listing but I am human & I can make a mistake. Please contact me before leaving anything less than positive feedback & I will try my best to make it right. Size Type: Juniors Lined: Yes Sleeve Style: Off-Shoulder Style: Crop Top Occasion: Evening, Occasion | Material: Nylon. It is a size large & in excellent condition. Size Type: Regular Sleeve Style: Sleeveless Style: Crop Top Occasion: Casual Material: Rayon. Cute crop top by H&M in size 10. Cap sleeves. Elastic around neckline, bottom, and end of sleeve. Floral pattern. The mannequin that is modeling it is a size 0 in the mannequin World of course it's too loose on her but it's only about 3 sizes too big for her at most so this will probably work for a size 4 Misses, unless a 4 runs large on you. 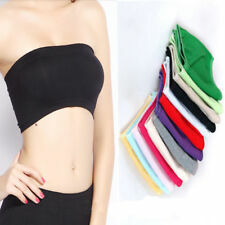 Size Type: Regular Sleeve Style: Sleeveless Style: Crop Top Occasion: Casual Material: 100% Polyester. 100% Authentic XOXO. Style: Crop Top. L:Roxana on 01-24-2019 13:13|C:3.55|P:9.99/13.97|Q:1|W:0.42|station:Flesh|image:Database. Sleeve Style: Long Sleeve. Size Type: Regular. U:746194764334|Style:XTT009|Rep:|schart:yes|Minutes:1|Am:create.